explore any potential option. First, Jim Saric and Pro Guide Jeff Hanson cast shallow cover on the pressured waters. Shimano troll in late fall in pursuit of a trophy. catching opportunities by taking advantage of the solar heat production on bright fall days. and Kevin Schmidt battle giant winds on Lake of the Woods. 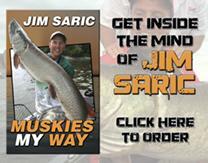 Musky fishing is often associated with long hours of hard work associated with short periods of pandemonium. Often short feeding windows occur due to environmental changes such as changing wind, light and moon periods. will bite, thus maximizing time on the water. variety of spots but have to throw the “kitchen sink” at the muskies to convert followers into biters. fishing a variety of spots and utilizing various techniques for fishing the French River in search of trophy muskies. 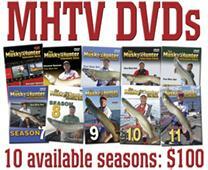 to locate muskies during this transition period. diverse fishery, even when battling giant winds. McMahon demonstrate how to pick apart shallow cover and make adjustments as the weather changes. they made produced an epic day.